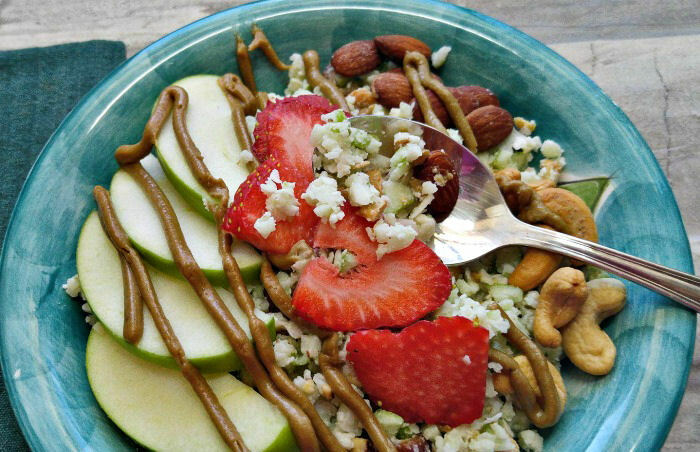 This healthy apple coconut breakfast bowl is chock full of fresh and healthy goodies. It comes together in just minutes and makes a great change from eggs when you are following a whole foods or high protein eating plan. The recipe is vegan, gluten free and Paleo and tastes amazing. Don’t get me wrong. My go-to plan when I want to reduce inflammation and feel more healthy is the Whole30 eating plan. But I do get a wee bit tired of eggs for breakfast about 2 weeks into the month! This delicious breakfast bowl of goodness is filling and tasty and gives me an “I’m eating granola” moment. It is the perfect addition to my list of Whole30 Breakfast recipes. Making this Healthy Apple Coconut Breakfast Bowl is a cinch. If you have a couple of minutes and a handful of ingredients, you are ready to enjoy this delicious breakfast bowl. It is the perfect easy breakfast recipe for those morning when you are in a hurry to get out the door. 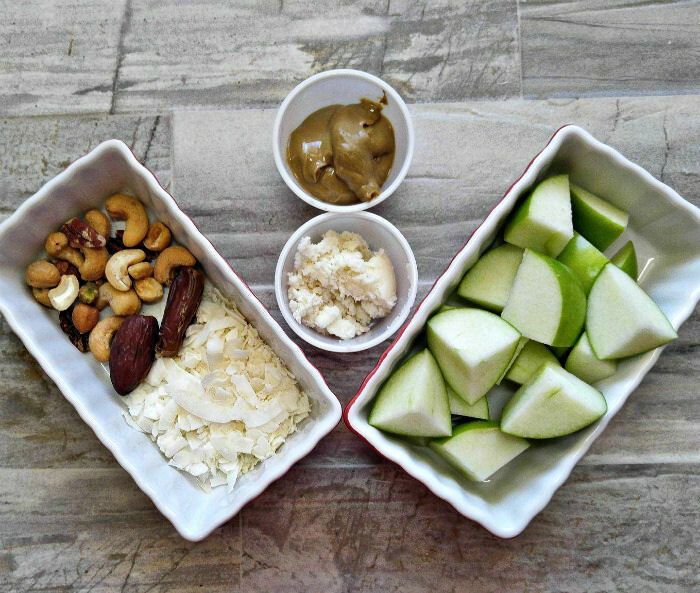 Mixed nuts, apples, unsweetened coconut, dates and both coconut butter, and sunflower nut butter make up this healthy mix. 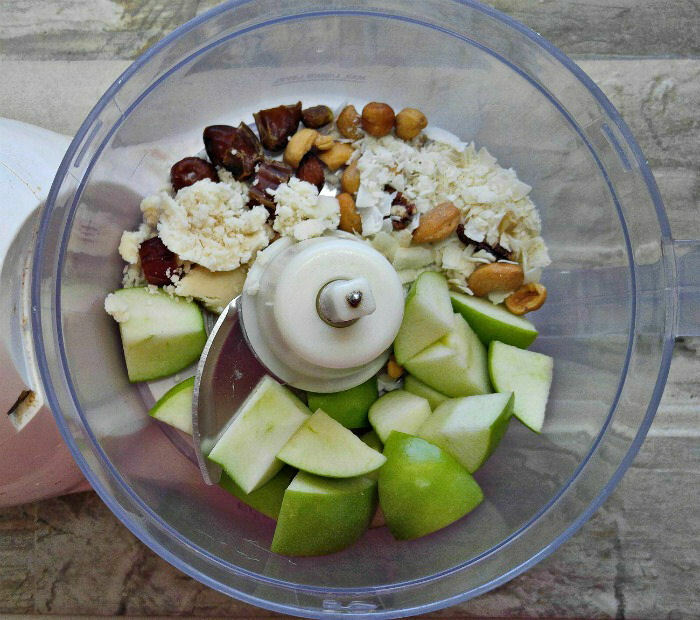 I started by adding the dates, nuts, coconut flakes and butter and apples in a food processor. I chopped the apple into large chunks and coarsely chopped the medjool dates first so the texture of the mix would be the way I wanted it. A few quick pulses and the mixture took on a texture that is something like a porridge. The taste of the recipe is nice as it is, but I wanted to give the breakfast bowl some extra crunch. Adding a few almonds and cashews, plus come thinly sliced apples gave me more texture. I also mixed a tablespoon of sunflower nut butter with a bit of water and heated it in the microwave. This allowed me to drizzle it over the top to counter balance the sweeter taste of the apple mix. A thinly sliced strawberry gives it some extra color too. Tasting this Paleo apple coconut breakfast bowl. This is one great tasting breakfast bowl. It is slightly sweet, slightly tart, has a bit of crunch and also a savory taste from the nut butter. The recipe is Vegan, Paleo, and Gluten Free and makes a change from high protein breakfasts featuring eggs. I love that it comes together in just a few minutes but tastes really amazing. This makes a fairly hearty sized bowl, which works out to 566 calories. It’s surprisingly filling and stays with you till well past lunch. 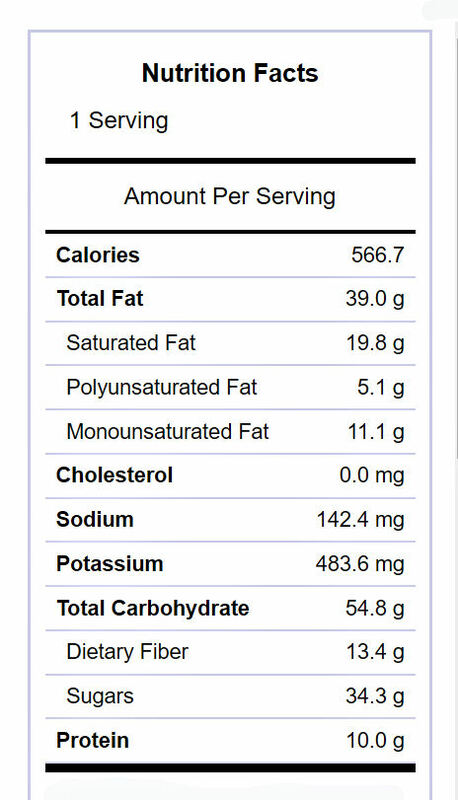 It is loaded with potassium, high in fiber and fairly low in sugar and sodium. If you, like me, are tired of eggs part way though your Whole30 month, give this delicious apple coconut breakfast bowl a try. It has become one of my favorite breakfast recipes. I have done the Whole30 plan twice and found that is such a help in controlling my inflammation. However, since this breakfast is quite sweet, this would seem to disqualify it from being totally Whole30 compliant if you are trying to follow this plan exactly as written and especially if you are trying to control the sugar dragon. This Whole30 apple coconut breakfast bowl is chock full of fresh and healthy goodies. It comes together in just minutes and makes a great change from eggs on the Whole30 plan. 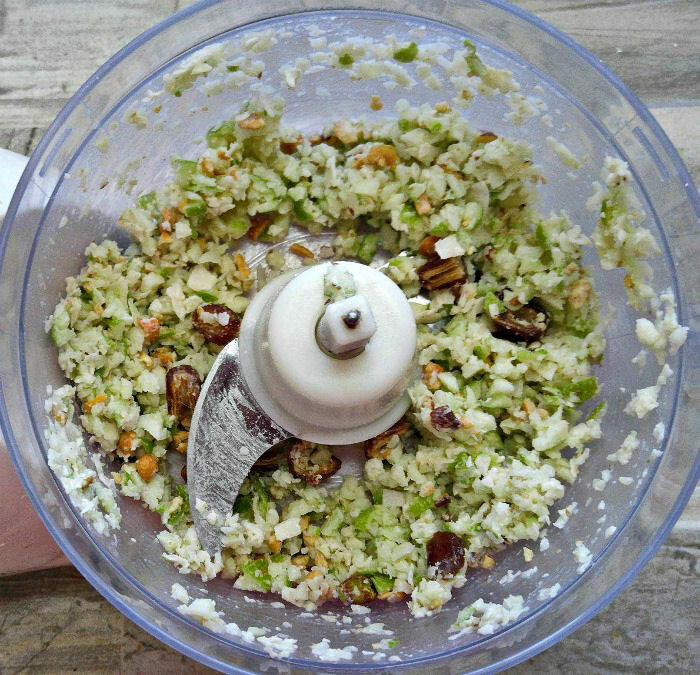 Add the ingredients for the breakfast bowl mix into a food processor. Pulse a few times to get a thick porridge like consistency. Place into a bowl. Add 4 thin slices of apple, 1 sliced strawberry and a few almonds and cashews. Heat the water and sunflower nut butter for about 30 seconds to make it soft. 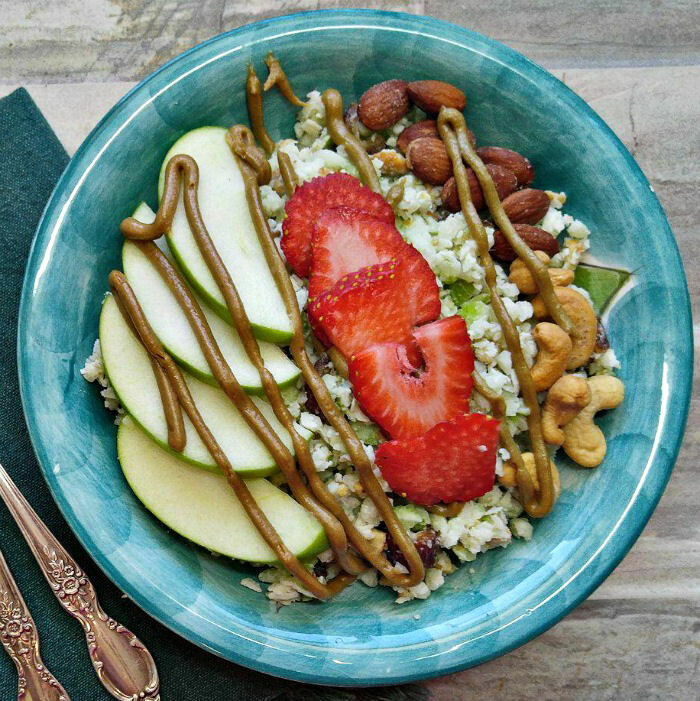 Drizzle the sunflower nut butter over the top of the breakfast bowl. Enjoy! I made this ahead for my husband’s breakfast. It was perfectly fine. I’m glad you enjoyed it Donna.